I make stuffed peppers once or twice a year. When I was newly married, they were touted as an inexpensive dish that all budget conscious cooks should master. The trouble, then and now, is that they're not a bargain to make and it's really possible for non-vegan types to buy a steak or gorgeous piece of fish for what they cost to assemble. Now, for those who love stuffed peppers, the cost is inconsequential and they can be enjoyed at any time of year. Those who like, but do not love them, are usually more circumspect and will enjoy them towards the end of summer when peppers are plentiful and can be purchased for just pennies on the dollar. Following the holiday, I was left with 6 gorgeous red peppers of the non-bargain variety. They had originally been purchased for a stir-fry of red and green peppers that never happened. I wanted to use the peppers before they began to wither in the vegetable crisper and stuffed peppers came to mind. I ran with the idea. I have several recipes for them and, I promise, before we're finished with each other, you'll have them all. However, the one I want to share with you today, is one I used when my children were still fairly young and not yet ready for truly spicy food. These are vaguely Moroccan in taste but they are mild and very pleasant on the tongue. I use lamb to make these because I think it is a better fit for the spices used in the recipe. The recipe appeared in Sunset magazine nearly thirty years ago. I've played with it, but it closely follows the one they published all those years ago. 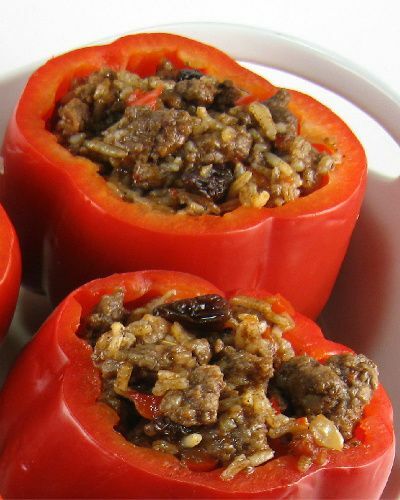 If you are looking for a recipe for stuffed peppers, I think you'll like this one. Technically, you need not serve anything with them, but I think they look so naked when plated by themselves that I weaken and serve them with mashed sweet potatoes and steamed spinach. Here's how the peppers are made.